It's easy to see beginnings but ends are harder. Certainly, that's true of the Brexit saga which twists, turns and doubles back on itself in unexpected ways - and continues to threaten the Good Friday Agreement, 21 years old this week. That international peace treaty has been key to Ireland's well-being. It has benefited both parts of this island socially, culturally and financially, paving the way for an all-Ireland economic alliance which demonstrates our ability to co-operate. An open Border has been an interlocking part of the success story. In April 1998, the world looked on in wonder as the impossible became reality, the improbable became a fact. Northern Ireland dominated news bulletins not for destruction but for embracing progress. Do you remember how you felt back when the Good Friday Agreement was signed? For me, it was as though a crippling weight was lifted. The next generation would be spared that burden of ancient grievances we had inherited. Now, we could savour the taste of hope. Brexit compromises that era-defining pact. If one positive thing can be said to emerge from the shambles, it is that Irish people know our open Border is worth struggling to keep. Its significance has been dismissed by Brexiteer fanatics such as Boris Johnson and Jacob Rees-Mogg - but we know how much confidence to place in their words. As for the DUP, it was out of step with the majority of people on both parts of this island when it opposed that historic settlement 21 years ago - and it remains wrong-footed today. The DUP has overplayed its hand in Westminster and made reunification more rather than less likely. It has snatched defeat from the jaws of victory. The party could have claimed it was delivering something for all peoples in the North, as opposed to its core voters, by backing a soft Brexit when urged to do so by business leaders and farmers. Instead, it rejected special status and stuck to its "blood red" line of no divergence between the region and Britain. Perhaps the DUP was fooled by Brexiteer promises of a painless withdrawal and readily-negotiated trade deals making Brexit a piece of cake. But Brexit soon turned into stale, dry bread. Now the party, unwilling to support Theresa May's Withdrawal Agreement, is venting its frustration - repeatedly insisting she should renegotiate the backstop. That's hot air. No amount of prodding from the DUP or backbench Tories in the European Research Group (ERG) can help her to surmount the EU's barrier. The Withdrawal Agreement can't be revisited. With the backstop on her mind, Arlene Foster went to Brussels to meet the EU's chief negotiator Michel Barnier this week, and called their talks constructive - pol-speak for "we didn't agree on anything but nobody stormed out". In the House of Commons, her party's deputy leader, Nigel Dodds, shared his reading of the latest Brextension, offered until October 31. In a highly idiosyncratic interpretation, he claimed the EU backed down by granting Britain more time and suggests the prime minister "learn the lesson" by pushing for backstop changes. How does he imagine Mrs May can force the EU to renegotiate? With tanks? Mr Dodds might just as well call on her to order France to hand back Calais. The DUP's hold on Mrs May's administration is over. We know this because Jeffrey Donaldson insisted on BBC Radio Ulster that the party remains influential, citing that fragile Tory majority. Parties which have influence don't need to take to the airwaves to say so. The DUP is caught fast. If it removes its confidence and supply arrangement, the government falls - and it may end up with Jeremy Corbyn to deal with. Its current strategy appears to be to chew on Mrs May while checking the wind's direction. DUP Brexit spokesperson Sammy Wilson treated himself to a rant about her broken promises and lost credibility, but she's taken so much abuse over the past two years it's doubtful if a Sammy-savaging registers. And so to the local and European elections next month. The DUP must be nervous about the former, at least, having parted company with many in its base over that hard Brexit fantasy. There is nothing as uncomfortable as lying in a bed you made yourself. Large sections of the Northern electorate have watched in dismay and, disenchanted though they are, may welcome the chance to use their vote. In Britain, the European elections have the potential to act as a proxy Brexit referendum, especially if leaders state their positions. For Mr Corbyn, in particular, it's a way to differentiate his party from the current administration - Labour's ambivalence throughout the Brexit drama has not been its finest hour. While the European elections may not be sufficient to change the present dynamic, they could signal a shift in the public mood. Other possible ways of overcoming the stasis gripping the House of Commons include a deal struck by Mr Corbyn and Mrs May, a new Tory leader, a general election, and a People's Vote. It's not impossible that Mr Corbyn's talks with Mrs May will deliver a soft Brexit - but don't hold your breath. 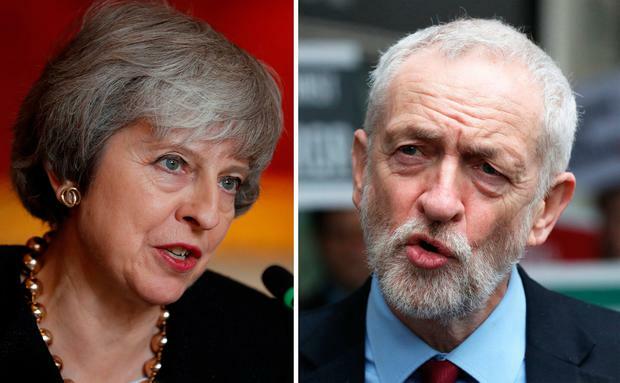 Two heads are better than one except if the heads in question belong to Mrs May and Mr Corbyn. Perhaps Mrs May secretly would like to step down and devote herself to some therapeutic gardening in her Thames-side home in the village of Sonning, an hour's drive from London. She must realise she has outlived her finest hour, that offer to resign an acknowledgement her political career was over. Maybe she's listening to her conscience in attempting to stick it out but the act of following your conscience doesn't absolve anyone of their mistakes. However, a new Conservative premier would inherit the same Brexit options she is grappling with, and just over six months until the latest deadline is a tight turnaround for anyone trying to reboot party policy. It's a poisoned chalice. Incidentally, those who pushed the falsehood that Brexit would be easy are among contenders to be the next Tory leader. The general election solution would serve the British people well because both Tories and Labour would have to state their Brexit positions in a party manifesto. Where do they stand on a People's Vote? On a soft Brexit? On no deal? Mr Corbyn, in particular, has embraced creative ambiguity a little too eagerly. Finally, the People's Vote: experts suggest the minimum timeframe for all legal steps required is between 22 and 24 weeks. So if a re-run is in the shake-up, preparations need to be under way soon. An alternative answer is for an enormous crane to lift off the Westminster roof, followed by a prolonged soaking to flush away the fog of inertia along with the stink of hysteria and hatred. Hands up, that's my preference.